Calling all coffee lovers! This delicious dinner is for you! 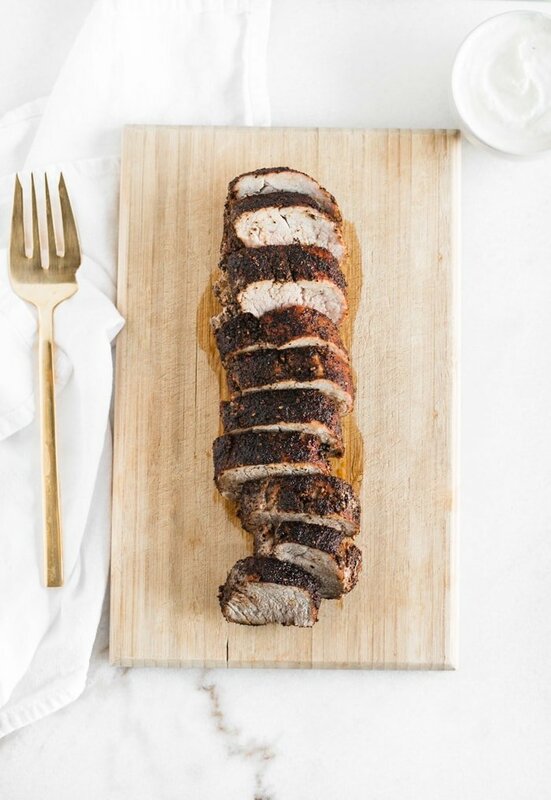 Even if you don’t love coffee, this coffee rubbed pork tenderloin is still for you. Because it doesn’t actually taste like coffee, really. It just tastes amazing. 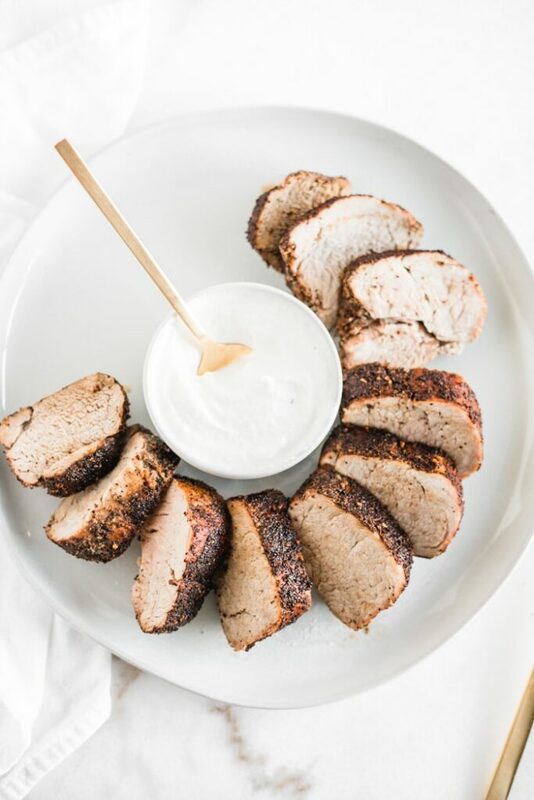 Coffee rubbed pork tenderloin with creamy horseradish sauce. It sounds fancy and a little difficult, right? Nothing could be further from the truth. This delicious pork tenderloin is ready in under 45 minutes from start to finish, and is so easy to whip up, even on a weeknight (though it’s pretty enough for a date night meal). The taste of this pork loin is phenomenal. The coffee flavor isn’t strong. It just adds a nice earthiness with the cocoa and forms a delicious crust on the outside with the black pepper. Chipotle adds a subtle kick, though you can add more if you prefer more spice. 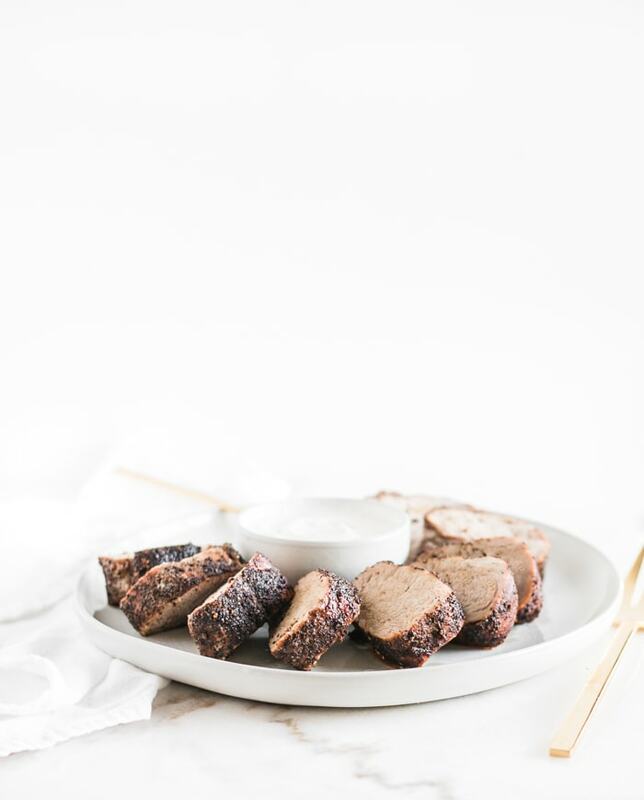 The super easy, creamy horseradish sauce balances out the flavors of the pork beautifully. So let’s get to it. 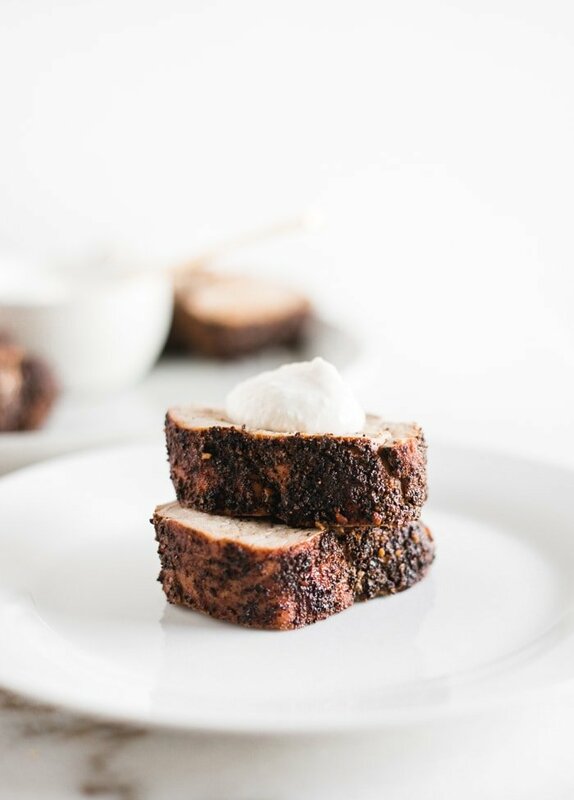 How do you make coffee rubbed pork tenderloin? It’s super simple, y’all. Grind your coffee really fine (like an espresso grind) and then mix it with the spices. Rub it all over the pork tenderloin, then rub some olive oil over it. Then cook it in a hot skillet in the oven, turning it over halfway through. While it cooks, stir together the creamy horseradish sauce. And dinner is done. 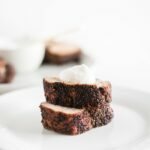 What should I serve with coffee rubbed pork tenderloin? To make it easy on yourself, serve it with sides that cook at a similar temperature in the oven. I like oven roasted rosemary potatoes or sweet potatoes, and a simple green veggie like brussels sprouts or green beans. A simple side salad is also lovely. For a wine pairing, anything goes! A nice cab would pair beautifully with the earthy flavors, while a crisp white would balance out the spice. Or if rosé is your jam, that works great too. 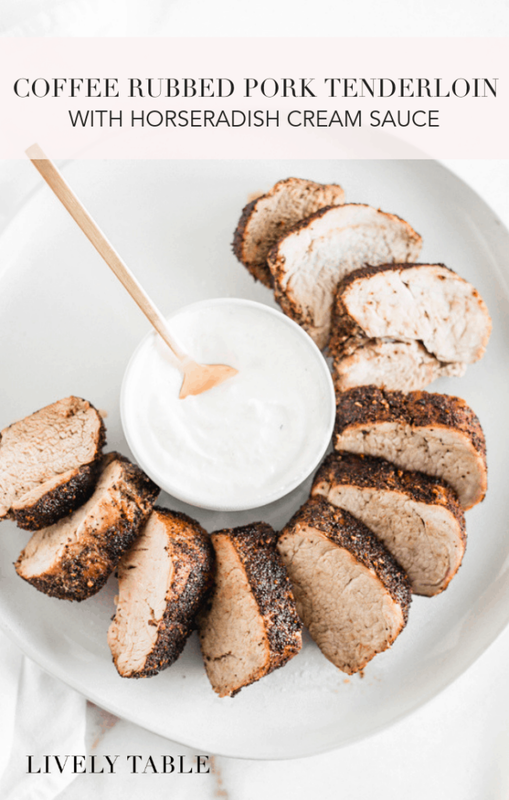 Date night, or weeknight, coffee rubbed pork tenderloin with creamy horseradish sauce is a simple and delicious dinner you’ll love! Heat oven to 400°F. Place a cast iron skillet in the oven to preheat. Trim any excess fat or silver skin off of tenderloin. In a small bowl, combine coffee, garlic powder, chipotle, pepper, salt, and cocoa. Rub on the entire outside of the pork tenderloin, then rub with oil. Carefully remove hot skillet from the oven and lightly oil if necessary. Place pork tenderloin in the skillet. Bake 20-30 minutes, or until a thermometer inserted in the center reads 140°F, flipping once halfway through. Meanwhile, prepare horseradish sauce. In a small bowl, whisk sour cream or yogurt with horseradish, salt and pepper. Taste and adjust amount of horseradish as needed. Remove from the oven and place tenderloin on a plate, covered, to rest 5-10 minutes before slicing. The inside will continue to cook to 145°F during the resting period. Slice pork and serve with horseradish sauce. You can easily double the recipe to serve more people (pork tenderloin is usually sold in packages of 2). If you don’t have a cast iron skillet, you can cook the pork in a glass or stoneware baking dish. Stoneware can be preheated, but I don’t recommend preheating glass pans because they can shatter.